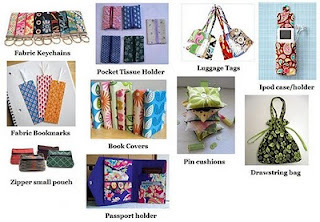 Well as we promise, here's some of the tutorials we found online what can be made from Fat Quarter fabrics. Hope you all enjoy these easy tutorials - Fat Quarter Projects. Don't forget to purchase your own set FQ fabrics in our blogshop before end date sell ya - if you interested, please click here. Feel free to share some of your ideas if you have any ;). Thank you to all crafter/sewist all around the world who's willing to share their ideas.